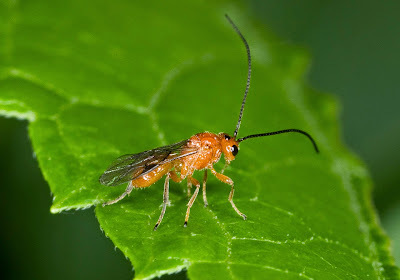 The Opiinae are a large cosmopolitan group of braconid wasps that are endoparasitic on larval cyclorrhaphous Diptera. In members of the tribe Ademonini, which are parasitic on larvae of Ephydridae inhabiting aquatic plants, the forewing has vein SR1 incomplete and the marginal cell is open; members of other tribes have the marginal cell closed (Achterberg 1993). Characters (from Achterberg 1993): Labial palp with four segments; occipital carina usually present laterally; pronope more or less developed; vein M+CU1 of forewing often at least partly unsclerotised.